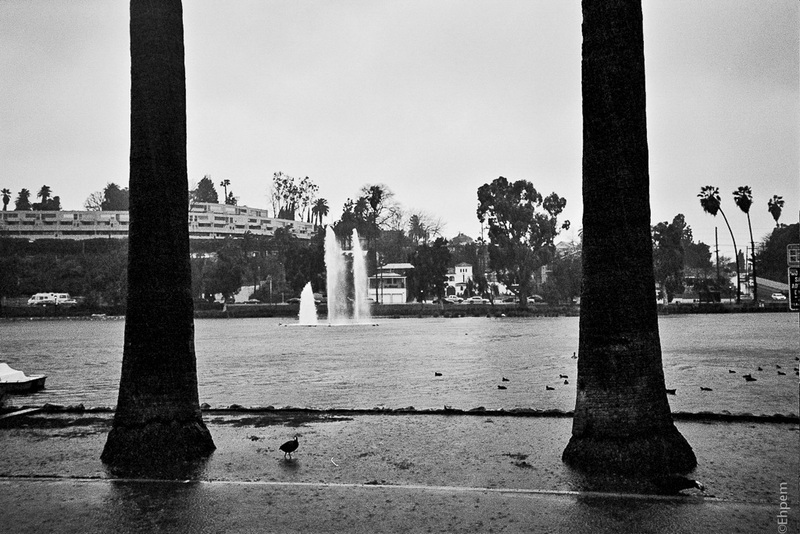 The day before the photo workshop started there was a torrential rain storm in Los Angeles. My DSLR got so wet, in about 5 minutes, that it stopped working. Thus, I shot most of the storm with an Olympus XA2 loaded with Ilford XP2; the film from that trip has just been processed. Fortunately, the DSLR came back to life just in time for the workshop. I am guessing this was ISO400. Glad the camera recovered from its ordeal! What a story – I bet you were worried. I was a bit concerned. My friend Melinda (http://wp.me/p1eZOQ-170g) who I was sharing an apartment with offered the use of her Nikon. Since her other camera only takes black and white I did not want to remove colour from her options, and I rarely shoot Nikons so they are not familiar in my hands. I find it important when trying to concentrate on making a photo to not have to worry about menu trees and buttons in unexpected places (one of the main reasons film point and shoot cameras work so well for me). The LA Center of Photography where the workshop was held found me an old model Canon that I could use. I have a back up camera (which was not with me, being on loan to my daughter) that is a similar model so I was familiar with the camera they loaned me. It’s a model with limited low light abilities, small sensor and some other features that I am not used to, but I knew I could shoot with it, the buttons in the same place with same function as my main DSLR, and so on. I also knew I could compensate for the camera’s limitations which are similar to shooting with some speeds of film. So, I was all ready to use the T2i when the 5Dii came back to life. I kept the T2i in my bag though because I did not trust the 5Dii at that point. I was pleased about having my camera back in action for the familiarity and its low light ability as my low-light photos which are some of my best from that trip.